By Autumn Anderson, BLY Instructor Ever since I was a child, good posture has been a challenge for me. At a young age, you’d be more likely to find me sitting on the couch reading a book than outside running around. While there’s nothing wrong with reading, writing, drawing or other activities that are inherently less physically active, the postures associated with them can lead to problems that many of us are facing as adults. These problems are only made worse by the desk jobs we often hold and the ever-growing attachment to our mobile devices. By now, you’ve probably heard enough about the growing health concerns caused by a more stagnant lifestyle, so instead of lecturing, I’m here to share some specific examples that have affected me personally, how I’m overcoming these issues by committing to self-care and ways to avoid the literal pain that stems from our daily activity and movement (or lack thereof). “Tech Neck” Whether you’re familiar with this tidbit or it’s the first time you’re hearing it, the fact is still quite startling: the average head weighs as much as a 10-12 pound bowling ball when it’s in the neutral position. And while the exact amount of change has been debated, it’s said to increase by almost double for each inch the head comes forward. While technology definitely gives us some unique abilities and opportunities to connect, we’re also paying the price. Imagine your cervical spine bearing the weight of a 20, 30 or even 40 pound bowling ball throughout the day. Talk about a pain in the neck! Of course this added weight will not only affect the upper body, but it can impact your mid- and lower back, as well. In addition to pinched nerves, muscular pain, headaches and a slew of other medical conditions, tech neck also visually impacts our posture, which can cause career-related issues, such as the appearance of low self-confidence, being less of a leader and ultimately less vital to the team. Because desk jobs and mobile devices aren’t going away any time soon, it’s critical to discover new ways to counteract the damage and reduce future impact. Chronic Stress and Anxiety Without getting overly scientific, the central nervous system is made of gray matter and white matter. With age, chronic stress and certain illnesses, we begin to lose that gray matter or experience imbalances between the gray and white, which can result in memory loss, emotional dysfunction and more. Fortunately, there are ways to combat both gray matter loss and the ongoing stress and anxiety that may cause it. Recent research indicates people who practice yoga have more gray matter than those who don’t, and that yoga may even increase gray matter! Prolonged Sitting “Sitting is the new smoking.” You’ve probably heard this recently - and with good reason. Research has shown that prolonged sitting can lead to serious health problems, like increased risk of cardiovascular disease, type 2 diabetes, cancer and more. In addition to the problems that come from sitting, much of this time is likely spent at a computer, with one arm extended to use a mouse and both shoulders forward to type. The postural problems that stem from desk work include shortened pectoralis minor muscles, forward rounded scapula, overstretched and weak muscles in the back, slouching and shallow breathing, just to name a few. Not only does poor posture cause these physical symptoms, it may also trigger emotional distress and depression. 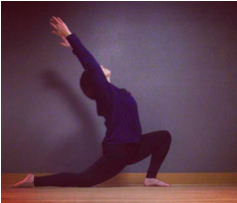 Mountain Pose: this is great way to practice good posture – the opposite of sitting! Whether you try this sequence or create your own, remember to bring awareness to your body and your breath, calm your mind, release the things you don’t need and acknowledge that it takes time and commitment to right the wrongs of repetitive daily movements. You can overcome and avoid pain through a consistent practice – just don’t overdo it. If you have questions about ways to manage pain or modify poses, don’t hesitate to ask any of our BLY instructors next time you stop by the studio! Autumn Anderson is a full-time branding and communications manager in the corporate world, certified endurance running coach, and 200-hour registered yoga teacher.